There was no more dismal period in any genre of American music than country music’s ordeal from about 1975 to about 1990. Pushed by Big Nashville’s urge to cash in on the big money in pop music, “crossover” was the watchword and goal and driving force behind Nashville’s main efforts during that whole stretch of time. Some country artists – Kenny Rogers and Eddie Rabbit and Barbara Mandrell and a whole lot of equally-forgettable tripe – existed purely to capitalize on the trend. The trend swallowed up years from the careers of some otherwise great country artists; who knows what could happen if Dolly Parton could get the years back that she spent trying to be a pop star? And some of the best country music of the era – indeed, some of the genre’s only music of the era that anyone has reason to remember – was specifically done as a reaction to that whole noxious trend; “The Outlaws”, Willie Nelson, Hank Williams Junior, Waylon Jennings, Emmylou Harris, Rodney Crowell and a few others who stuck to and extended on country’s twangy roots, were about the only products of the era worth remembering. Lee Greenwood was very much in the former group. Is he country? Is he Vegas? Is he new wave? He’d just as soon you not worry about it! Having worked in Country radio a few times – in 1982 and 1984 and 1991-92 – I can remember what an utterly dismal thing country was, in that wretched era before Garth Brooks and Patty Loveless and Dwight Yoakam and Holly Dunn and the whole crowd of “back to the roots” singers paradoxically made country a colossal success by dragging it “backward” twenty years. 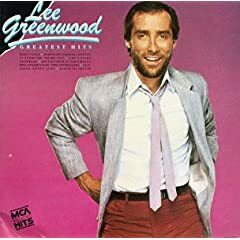 Lee Greenwood had been one of the big offenders, doing treacly, overproduced glop whose only connection with “country” was a little arklahoma twang in his voice and, of course, a relentless tugging on the heartland’s heartstrings. Which is what gave us “God Bless the USA“. And make no mistake about it; “GBTUSA” has everything that made Lee Greenwood such a lowlight of “country” music for that entire dismal period of time; lots of violins, but nary a fiddle to be found; electric guitars, but none of them pedal steel; lots of vocals, but the most generic voice imaginable. That cloying sense that the song is trying hard to push every button you have. Well, maybe not for you. Indeed, as John Edwards once said whilst running between a hair appointment and a date with his mistress, there are two Americas; one that hates “God Bless The USA” and is mildly creeped out by everything it stands for, and another that may or may not be silently amused by the song, but still gets a thrill in its heart from all of its glorious, mawkish sentiment. And it is gloriously, over the top mawkish; if your heartstrings aren’t rated for 2000 points of pull, they will snap like Nancy Pelosi’s facial muscles when someone pops a paper bag behind her. But aside from being perhaps a perfect lab experiment showing the absolute limits of emotional button-pushing in song, the song has been adopted – intentionally or not – by that second America, as a sort of huge, glowing middle finger aimed at the first one. Because when Greenwood and his background singers – it could be the Red Army Choir, for crying out loud – wind up and attack that last big finish, it challenges you not to say “Yes, Chauncey Boston-Cosmopolitan, the idea of America transcends its problems; the promise of this experiment supercedes its mistakes; it is a concept deserving of loyalty for its own sake; we are a shining city on the hill, and we are the best attempt at a nation that this world has ever seen, viewed objectively and ethically. You have the right to disagree – but in the meantime, shut your impotent babbling pseudointellectual piehole, because I’m gonna sing and wave the flag for a moment”. A symptom of obstinate, unthinking jingoism? A thud-witted rejection of the reflexive dialecticism that “educated” Americans are supposed to embrace (and which many do, most of them with little more literacy than the most jingoistic redneck), that believes to every good there must be an equal yet opposite evil? But let me say in response that there ain’t no doubt I love this land. And, in conclusion, God Bless the USA. Or, as the kids today say, “America; F*** Yeah”. There. I believe I settled that. This entry was posted in mitch, Music and tagged Love and Hate by Mitch Berg. Bookmark the permalink. Patriotism, the last refuge of the scoundrel. I always thought the last refuge of the scoundrel was located somewhere in the Badlands. Hey Pigsh*t, so which are you a scoundrel or unpatriotic? My reply, accuse the dissenter of being un-American again please Ms. Bachmann. The point was simple Mikee – I have no issue with the song, I agree with Mitch that there is something profoundly satisfying and visceral in screaming back at an uncruel world, God and Country! Dammit! But, if we decide to use a song as a definition of an attitude that anyone who questions ‘country’ (meaning our country) is to be reviled, well, then we get hoisted by the same petard – meaning, when our President isn’t the current one, the guy sitting at 1400 Pennsylvania makes us unhappy, then we become rather hypocritical. Get it? I greatly respect Mitch’s musical knowledge, much as I respect a great deal of his political knowledge, if you need to stoop to scatology and assinine questions, well, I guess we know which of us is stepping in pigsh#t. I was making a simple point – the song can be overused. Nice inference of false patriotism without anything to back it up. As usual. Yeah, Plymouth Mike, leave the scatology to me! That’s my area of expertise. Peev, go eat a fart. So, peev, are you a patriot? OK, sure, Lee Greenwood is patriotism personified. But that doesn’t stop him from desecrating the flag in the image above. I mean, geez, this is one thing that drives me crazy. If you love the flag, would it kill you to at least take the time to understand the rules regarding showing it respect? Leave it to Miss Peev to derail a simple post and drag it into the territory of hateful little trolls on the left. Don’t you have a blog, Pernicious Peev? Or is it that you don’t have enough traffic? As soon as you put the stars to stripes, it’s a real flag. I think that “….it’s for the children” has long since replaced patriotism as the last refuge of scoundrels. And props to Mitch for totally sticking the landing on that double twist dismount. Yes, everyone should read “Miss Manners For Flags”. Kind of a bad pairing, Mitch. You like Lee Greenwood, don’t like Radiohead. The only way to top this is to admit you hate the Clash, love The Captain and Tennille. Kind of a bad pairing, Mitch. Which is why I ran it. Er, no. Read it again. Didn’t like Greenwood or anyone else in that entire genre of “country”. don’t like Radiohead. The only way to top this is to admit you hate the Clash, love The Captain and Tennille. I know the Clash. Radiohead ain’t The Clash. And I lost interest in Captain and Tennille after they sold out and left the underground. Hey Pigsh*t, you’re a liar and seriously demented if you think you can square your first comment by burying it with your second comment, you weren’t saying that at all. Which is why you’re Pigsh*t and now a liar. You see, other people can use Saul Alinsky’s fifth rule too, how does it feel? Oh yah… hee, hee, hee, hee! Waiting for Green Day to cover Muskrat Love. Lee Greenwood grew up in Sacramento, so we always thought of him as a local boy. Like Jeff Gordon, I don’t know where he gets a southern drawl. South Sacramento, and South Vallejo I guess. By the way, glad to see you admit that patriotism, for you wingnuts, is little more than an insult directed at Americans with whom you disagree politically. We normal people always knew that love of country is something more than sitting outside your trailer with a t-shirt reading “THESE COLORS DON’T RUN.” But it’s interesting to know you wingnuts don’t see much difference between waving a flag and flipping a bird in the direction of your betters.